Lots and lots of dryad's saddle polypore (Cerioporus squamosus) are out and at a perfect consumption stage in southern New England right now. 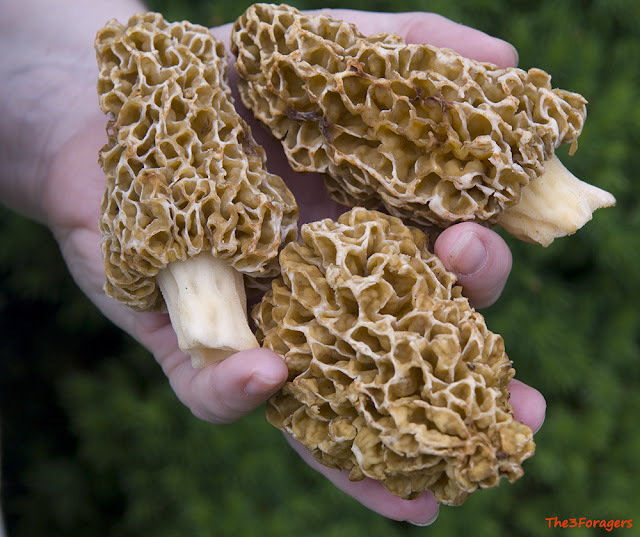 Some people accept them as the "consolation prize" for not finding morels, but we argue that since dryad's are so abundant, why not find tasty ways to use them? 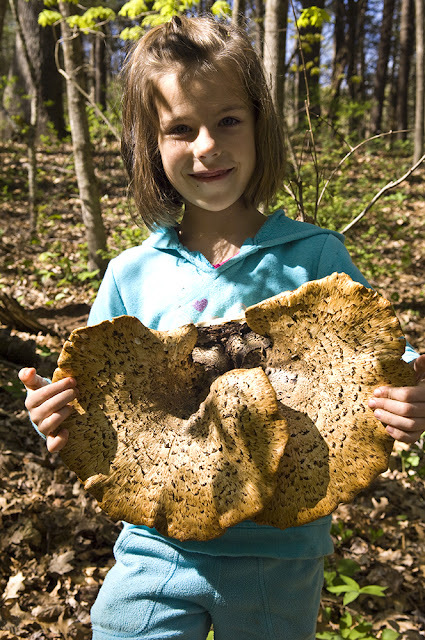 We personally find their taste mild, better than some other marginal polypores that people will eat (I'm referring to Berkley's polypore or the black staining polypore) in the coming summer months, and their texture quite excellent when collected young enough. Here, the dryad's get paired with some sauce made with gochujang, a Korean chili pepper paste that also contains glutinous rice, fermented soybeans, salt, and sometimes sweeteners. We buy it in a bright red tub at a local Asian market, and keep it refrigerated once opened. 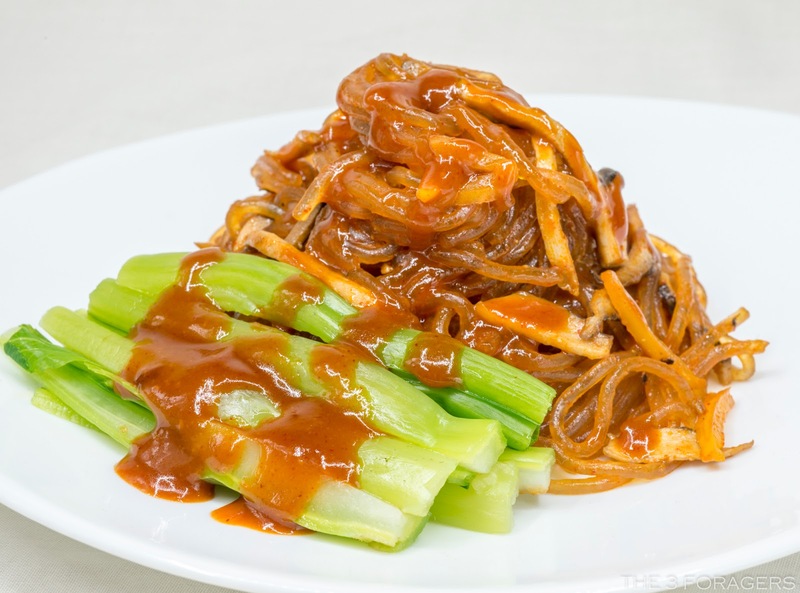 The sauce is also made with some added miso, soy sauce, rice vinegar, and sesame oil, then simmered and reduced until it is quite thick, before stirring it into the diced or sliced dryad's that has been pan seared for 5-7 minutes. 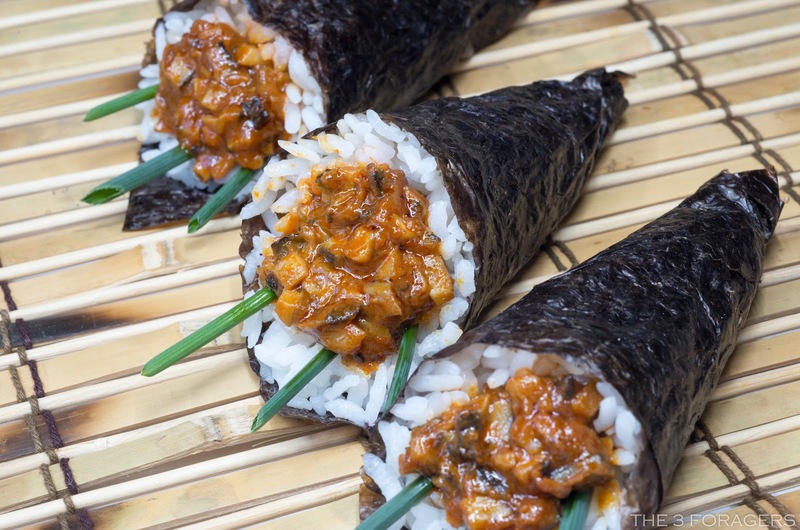 The diced and sauced dryad's got stuffed into some temaki hand rolls with seasoned sushi rice and chopped wild garlic. Another meal was made by cooking some Korean sweet potato starch noodles, and tossing them with the cooked, sliced dryad's and the gochujang sauce, and serving it with a side of steamed Chinese broccoli. The new growth of some conifers is just starting, and we can collect the tender tips to eat raw and create some recipes. We collect the tips from several conifers, including several types of spruce (Picea species), fir (Abies species), eastern hemlock (Tsuga canadensis), and white pine (Pinus strobus). The flavor of each species is different, so we taste the tips before we collect any to make sure we like the flavor, which can range from resinous, sour, tangy, similar to grapefruit, or fresh and piney. Conifer tips and needles do contain Vitamin C and carotenoids, along with minerals like potassium and magnesium. An infusion can be made from any of the edible conifer tips by pouring boiling water over chopped or mashed needles and tips and allowing it to steep for 10 minutes or so. We also make a mixed conifer syrup with sugar, and use it to make soda by adding the syrup to seltzer. Both salt and sugar can be infused with the flavors of conifer tips by grinding them together with a mortar and pestle, then dehydrating the salt or sugar before storing in an air-tight jar. The salt can be used on fish or meats, and the sugar can be used to bake desserts. I infused crushed, young spruce tips in boiling water to make a strong tea, then made the curd with eggs, sugar, and the spruce infusion. The spruce curd can be eaten with a spoon, fill some dessert steamed buns, added to whipped cream for a light mousse, sandwiched between cookies, served with crepes, or used in many other applications. I find that cooking or heating the tips makes them a bit tough, so the minced bits are added to the cooled curd at the end. 1. Chop or crush 2 c. of spruce tips and place them in a heat proof bowl. Pour the boiling water over the crushed tips and cover, and allow them to infuse for 15-30 minutes, until cooled a bit. 2. Using a coffee strainer, strain the crushed tips from the infusion. 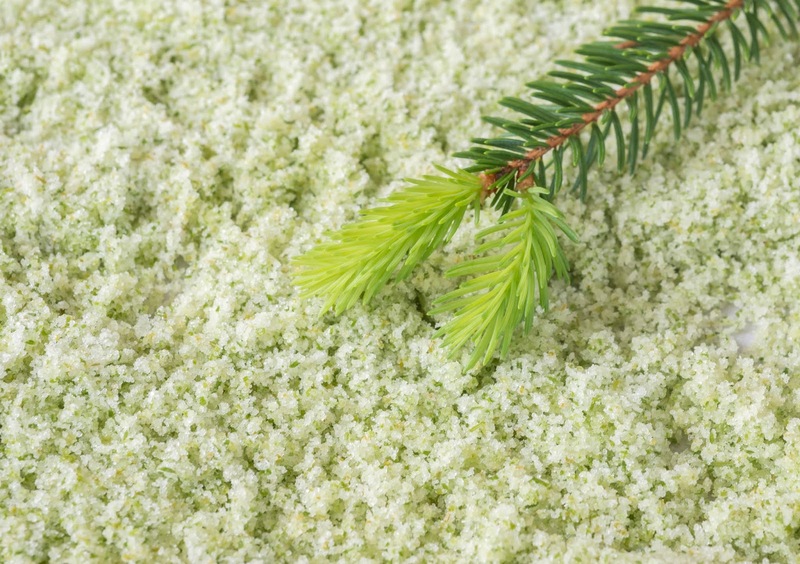 In a blender, add the additional 1 c. of spruce tips and the infusion. Blend for 15 seconds. Strain the infusion again to remove the solids. You will need 2 c. of infusion to continue, it will be milky-white. 3. 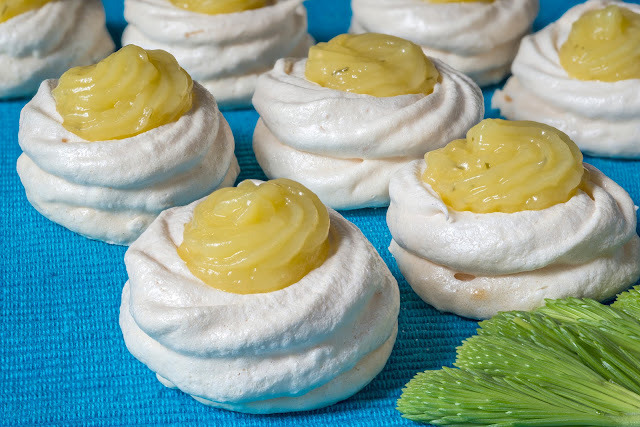 In a sauce pot, combine the cornstarch, sugar, and pinch of salt and whisk until no lumps can be seen. 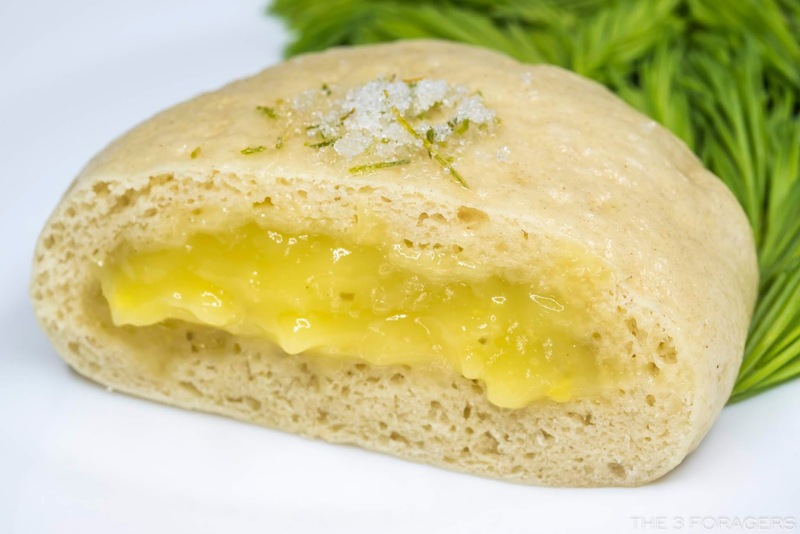 Add 2 c. of spruce infusion, egg yolks, and the lime juice. 4. Over medium-low heat, cook the curd slowly while running a rubber spatula around the sides and bottom of the sauce pot often. It will take 5-8 minutes for the curd to thicken, and once it starts boiling slowly, cook for an additional minute. Stir in the butter, and remove from the heat. 5. Allow the curd to cool in a bowl, covered with plastic wrap placed directly on the surface (otherwise a skin will form) for about 15 minutes. Stir in the minced spruce tips, then recover and refrigerate until service. Another edible spring mushroom is a white rotter of hardwoods: the dryad's saddle (since it looks a bit like a seat or saddle for some woodland fairy or nymph), pheasant back (because the cap looks like the feathers of a pheasant), or Cerioporus squamosus--while in older publications you'll find it as Polyporus squamosus. It can be both mildly parasitic on live trees and saprobic on dead trees, and we find them often on maples that are part of old stone walls all over our New England fields and forests. The fruit bodies are annuals, but may sometimes persist for many months before drying up. 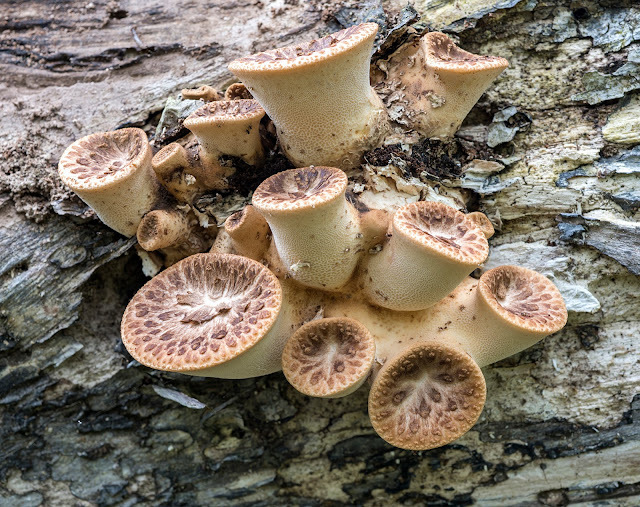 When the weather cools down again in autumn, dryad's saddle may fruit again. They often appear for many years on the same tree. 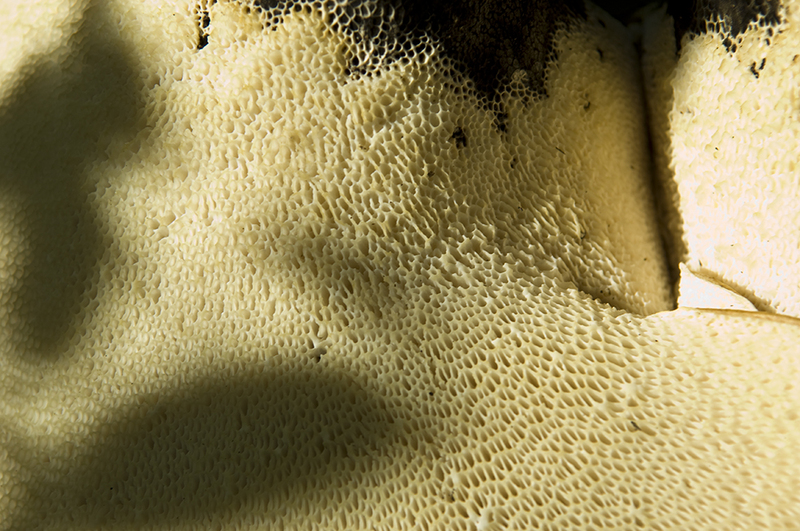 As a polypore, there are many pores on the underside of each cap that start out small and crowded but expand as the cap grows; if the pores are still small they can be left intact, but on larger ones they can be scraped off. The tops of the caps have some tufts of fibers that are arranged in concentric circles and give the feathery appearance; on larger specimens we peel off the cap skin before consuming. We prefer to pick them in their "pig's nose" stage when the flesh is very tender, as they soon toughen up and become inedible. It's best to go by texture when collecting for the table, as sometimes even larger specimens are still tender along the edges; as long as a knife passes easily through the flesh, it is still good to eat. Several people suggest using older specimens in soup broth for flavoring. 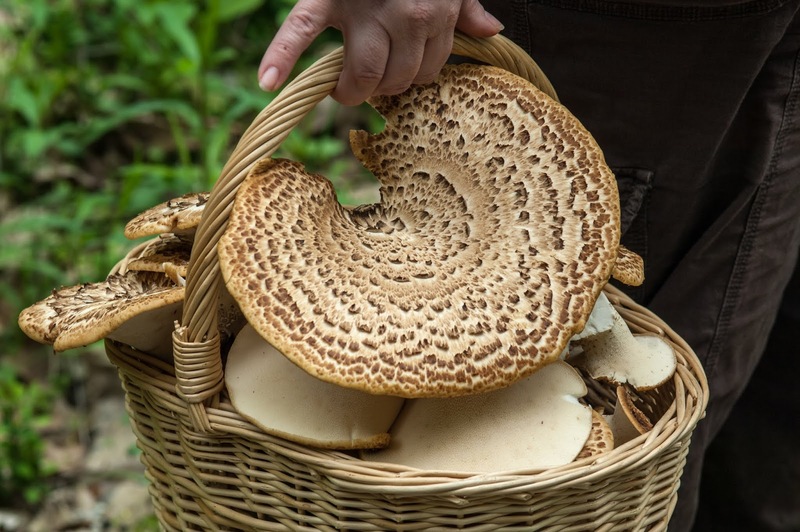 The flavor is very mild and nutty, which is interesting because the fresh dryad's saddle is strongly watermelon rind or cucumber scented. They pickle well once boiled, and are great added to stir fries. If you use the smaller pig's noses, you can slice off some pretty consistent discs to coat with crumbs and deep fry, making a crunchy snack once dipped into some homemade yellow tomato sauce. 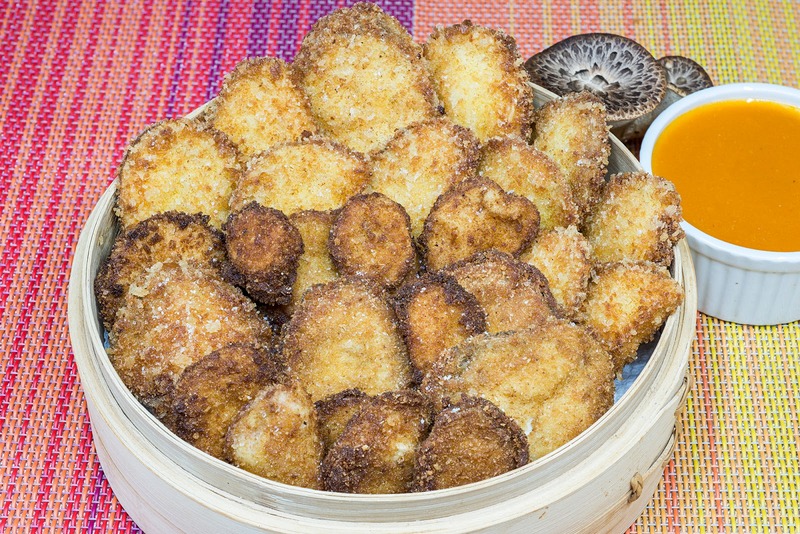 The fried discs can also be topped with the sauce and some fresh mozzarella and grated Parmesan then served over pasta to make some "Dryad's Parmesan" casserole for dinner. 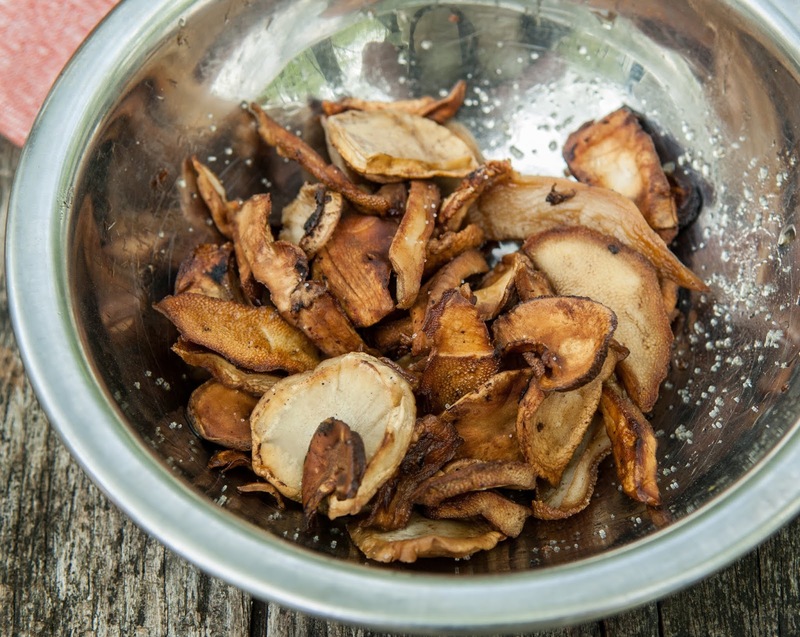 Since we often find the dryad's saddle while out hunting morels during our first camping trips of the year, they get fried up over the campfire for a smoky, crispy treat. Because of their mild flavor and firm flesh, they are very versatile in many dishes and preparations. Morels (Morchella americana, in this case) are not terribly common or abundant in our area of southeastern Connecticut, we often end up driving a few hours west to the Berkshires to find some. Once in a while, we find a handful in one of our wild asparagus patch just a few miles away, this year that number was only eight. I figured that if I sliced the morels in half, that would give me 16 hollow caps to stuff, enough for a hearty meal. We had a small bundle of ramps greens (Allium tricoccum) in the fridge, so I used their funky-garlicky flavor as a seasoning in three different stuffings. Risotto: For the broth, I used a vegetable broth base and added some dehydrated morels from past years, then removed the re-hydrated morels, finely chopped them, and added them to the risotto. 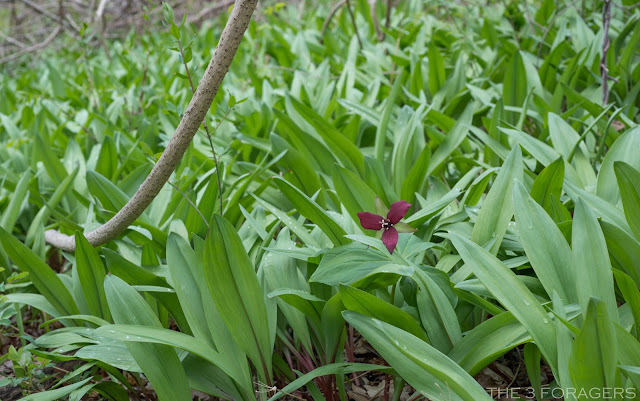 Instead of onions or garlic, I removed the purplish stems from the ramps leaves and finely chopped them--they are quite flavorful and succulent. The risotto was also cooked with a touch of dry white wine and had Parmesan cheese stirred in. At the end of cooking when the risotto was just barely done and still a touch soupy, I added another bunch of the chopped, purple stems of ramps for an additional color and flavor boost. Polenta: To make the polenta, I used some more of the morel-accented broth and finely diced, re-hydrated morels. A generous portion of tangy goat cheese and some butter were whipped into the polenta as it finished cooking, making it light and creamy, and I added some freshly chopped ramps greens at the end, with a few grinds of fresh black pepper from the pepper mill. Potato: I used some starchy russets as this base, boiled and then pressed through the ricer for fluffiness, then enhanced with a few pats of butter and several spoonfuls of pureed ramps greens. When we collect just the leaves of ramps, we will puree a good amount of them in the Vitamix with some olive oil and salt, making a dark green, pungent paste that freezes exceptionally well. We like to keep at least a dozen 4 oz. containers of this puree in the freezer to use all year, swirled into soups, breads, rice dishes, or anything that needs a rampy kick. The mashed potato stuffing also had some grated sharp white cheddar cheese and an egg for richness and firmness once baked. 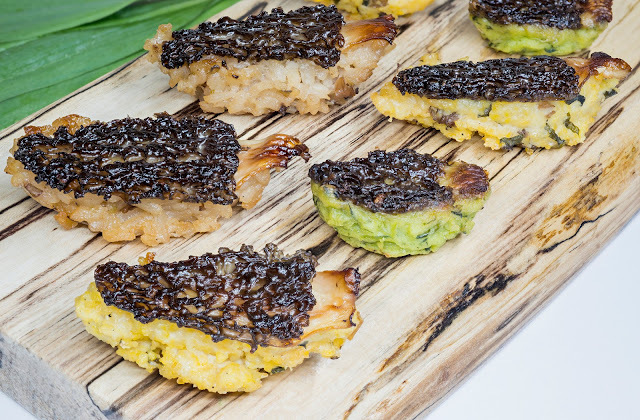 Once the three fillings were made, I sliced each morel in half from top to bottom. A mounded portion of stuffing went into the hollow cavities, and I placed them in the fridge overnight to firm up the stuffings. At lunchtime, the chilled, stuffed morels got pan fired on the stovetop in a heavy cast iron pan, then baked in a hot oven for 20 minutes. 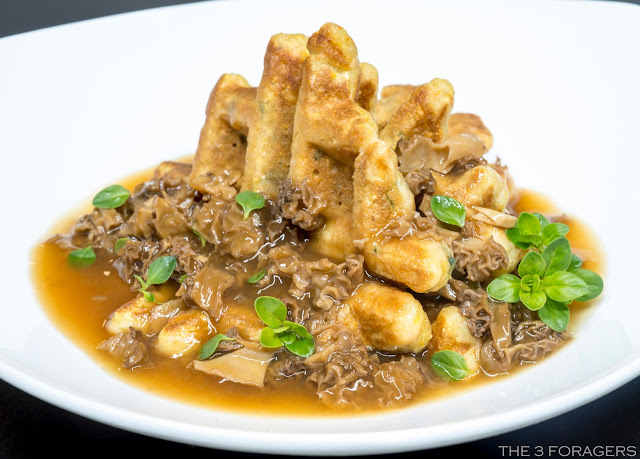 Unfortunately, the mushroom was mostly hidden under the stuffing, but Robert turned them upside down to see the deeply caramelized, crispy morel that once held the stuffing had become more like a small pie crust for the savory fillings. 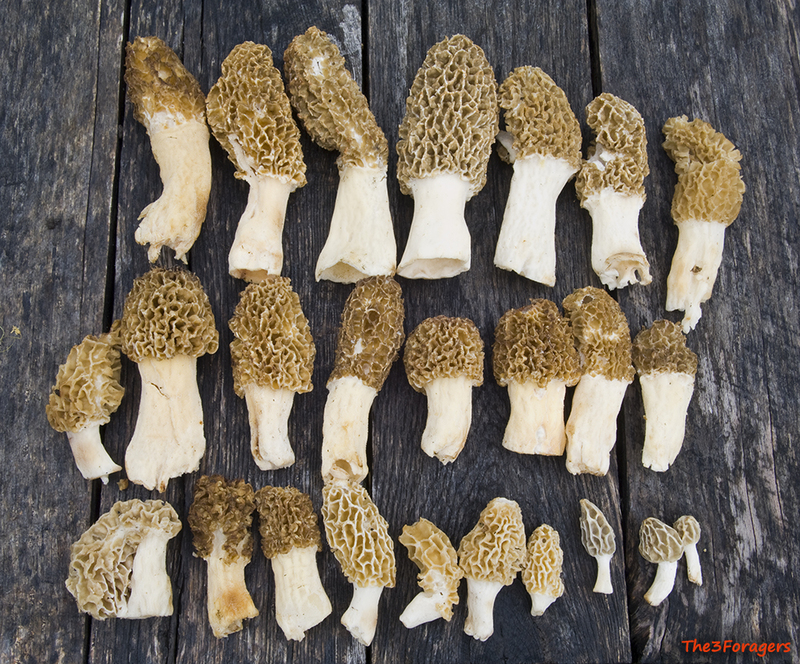 We let the morels cool a bit, then popped them in our mouths after they were dipped into some morel-Marsala gravy. You can find patches of wild asparagus (Asparagus officinalis) in nearly the entire United States, if you know where and when to spot them. In our area, they are found in old fields, perhaps left over from farmland gardens, or planted when birds consumed the red berries in the autumn. It's easiest to spot them in late summer, though, after they have shot up to 4 feet tall and formed their feathery branches and sparse berries--which are not edible. The foliage has a greenish-blue hue, so it stands out in a field of mostly green grass or maturing hay. 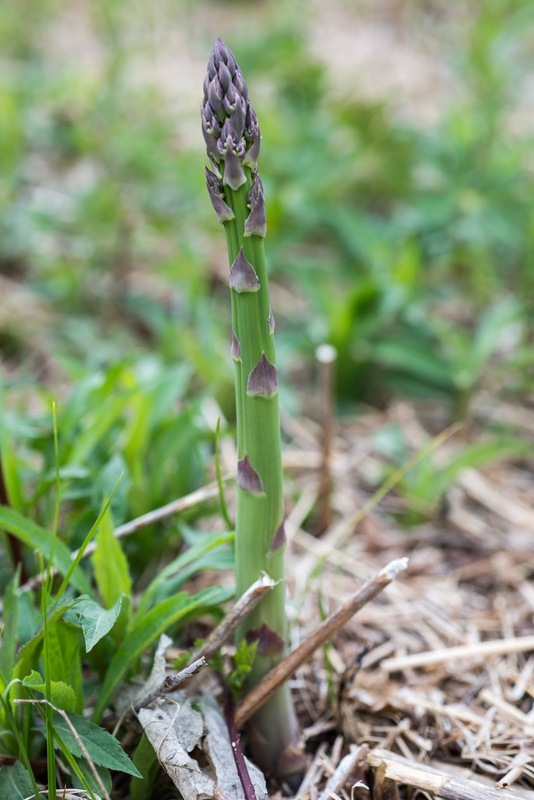 Then the trick is to remember all of the places you saw the asparagus growing and come back in the spring to collect them when they are shoots, which is the stage we all recognize from the grocery store. 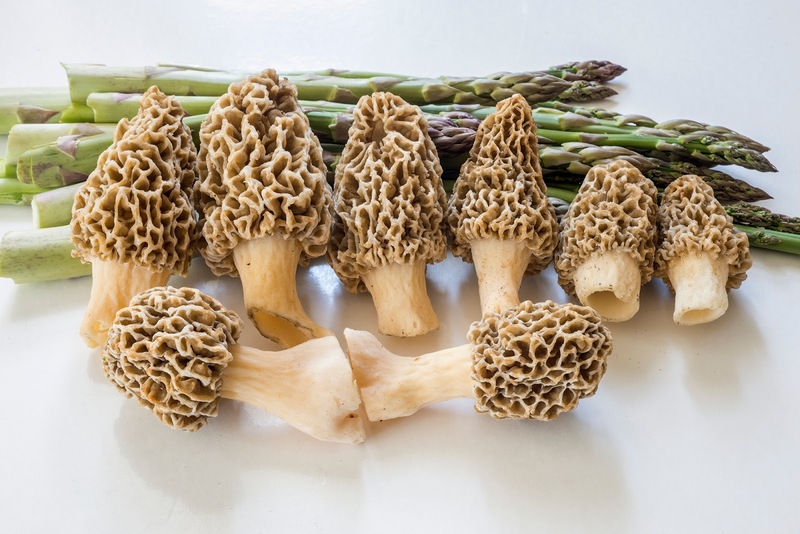 Morels (Morchella americana) are out at the same time, and these two spring foods combine well for a tender and flavorful risotto. As a matter of fact, it was a few years ago that we were collecting some wild asparagus in a field surrounded by old ash trees, when Robert noticed there were actually morels growing in the grass, 149 of them! 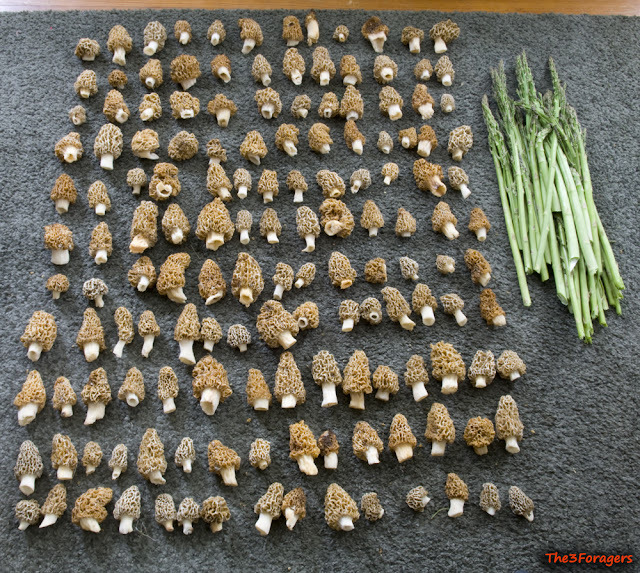 While the asparagus patch still produces a few dozen spears each year, we haven't found the bounty of morels again, this year only finding 8 of them in the woods nearby. 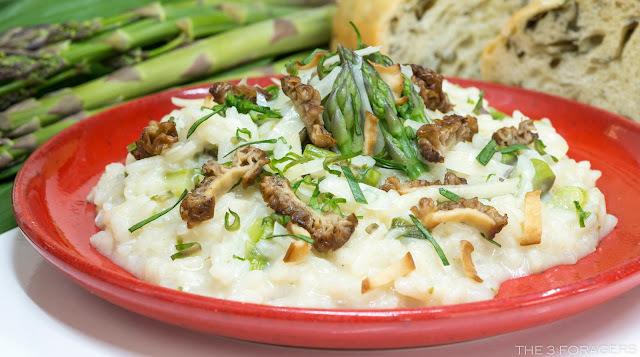 The risotto was made with vegetable broth that had a few dried morels added for flavor, white wine, sauteed morels, steamed asparagus, and some fresh chopped ramps greens. 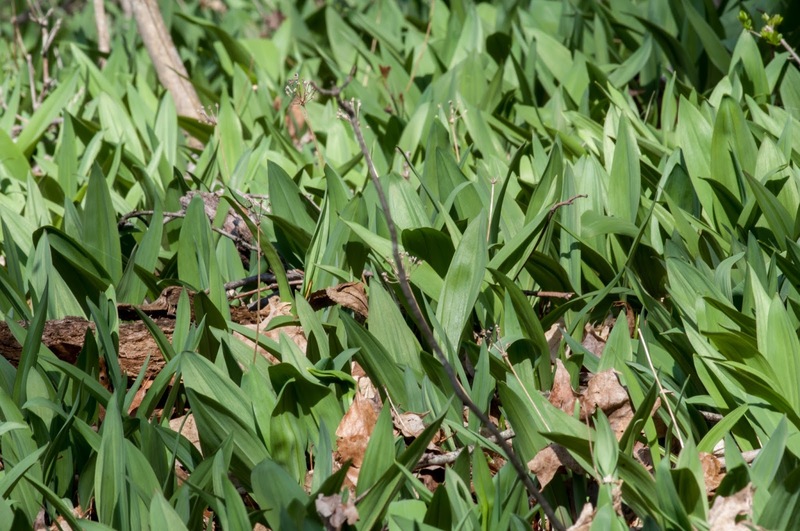 Spring for foragers in the northeast includes ramps (Allium tricoccum) and if you are very lucky and persistent, morels (Morchella americana in this case). 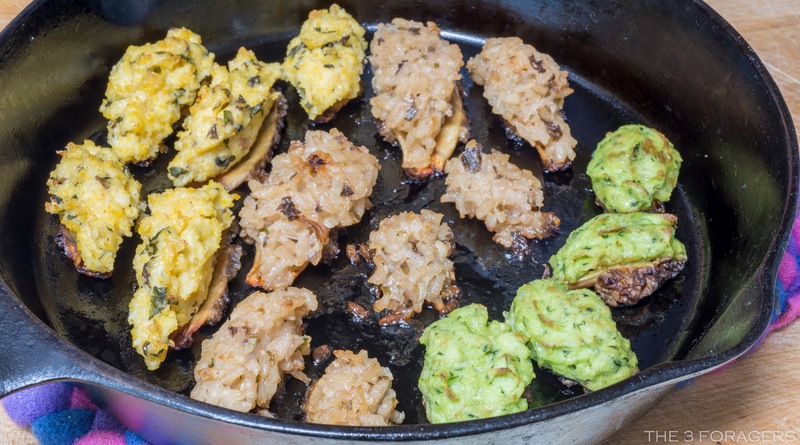 They taste great together in assorted pilaf recipes, sauteed with some pasta, and last year we made some savory cornmeal waffles with ramps greens, and topped it with a morel-Marsala gravy. Sadly, we don't find a lot of morels to make this often enough to test a real recipe, this was a bit of an experiment for dinner that worked out nicely.